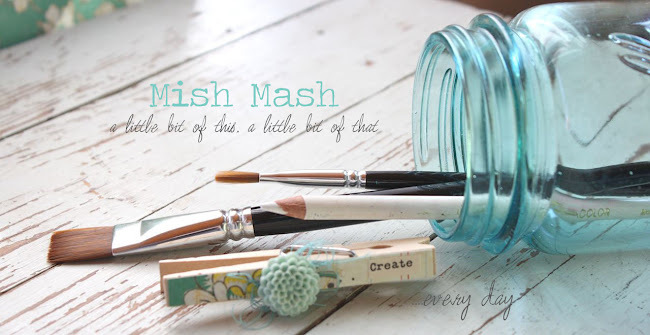 As I'm wrapping up my April projects for the blog, it reminds me that May will be right around the corner. That means school will be out, we'll be spending lots of time outdoors, our house will be filled with kids, the pool will be opening, we'll be taking some road trips, tackling some projects, gardening, heading to the lake....and just enjoying the Summer. 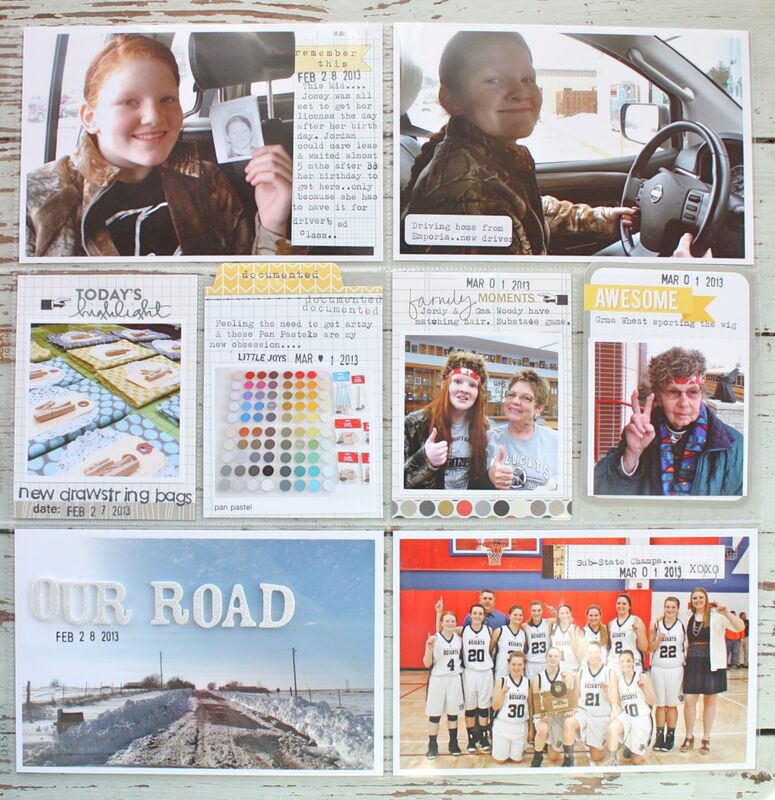 It makes it a little harder to keep a steady schedule of crafty creations here on the blog but I've got lots of fun, ongoing projects to keep me busy. I thought I'd share a little lineup of what you'll be seeing throughout the Summer months. 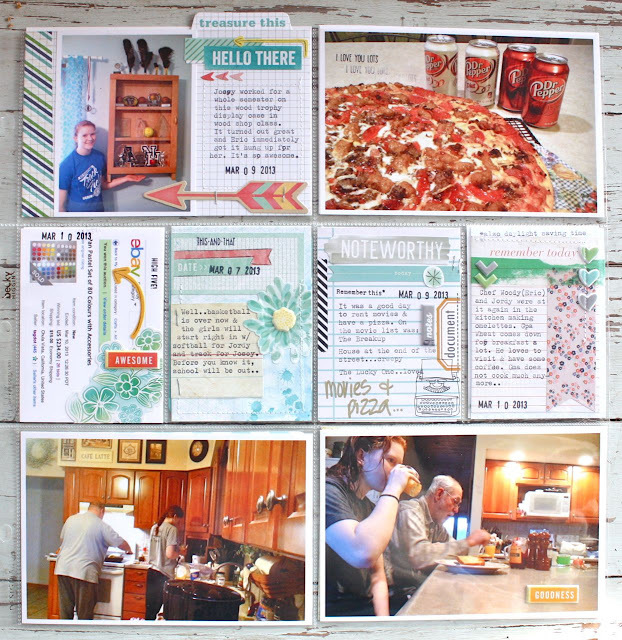 I am thoroughly enjoying working with Gossamer Blue. The monthly kits have increased my creativity tremendously and Lori selects the most fantastic products month after month. There will be exciting new things coming up so be sure to stay tuned. You'll be able to view the Design Team Gallery & purchase new kits on May 1st. Here are some quick facts that might answer some questions you have if you're interested in purchasing the kits. 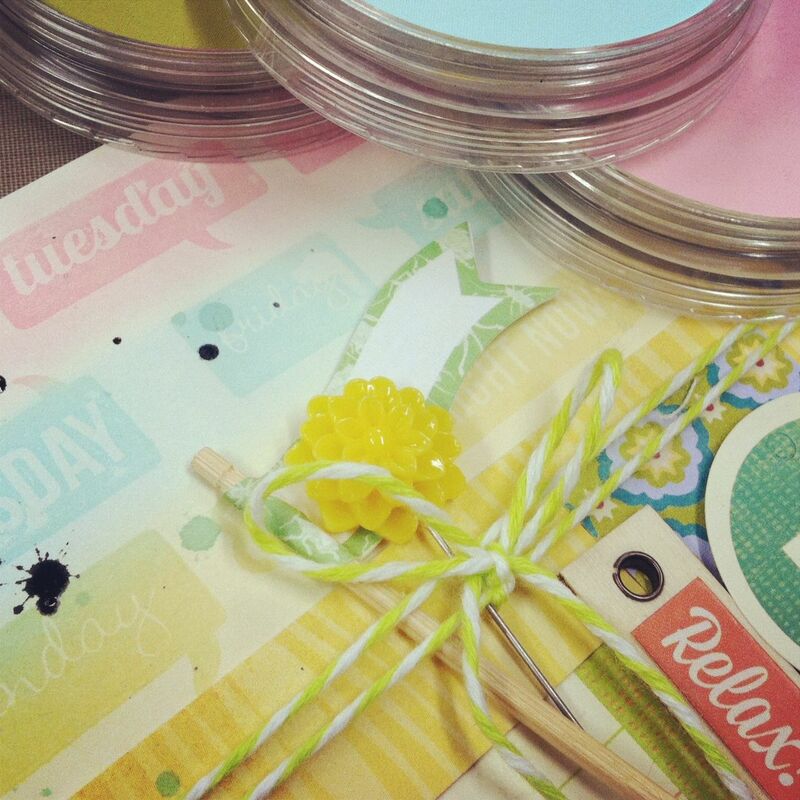 I have some fun sneak peeks to show you for what's coming in May for Gossamer Blue too. 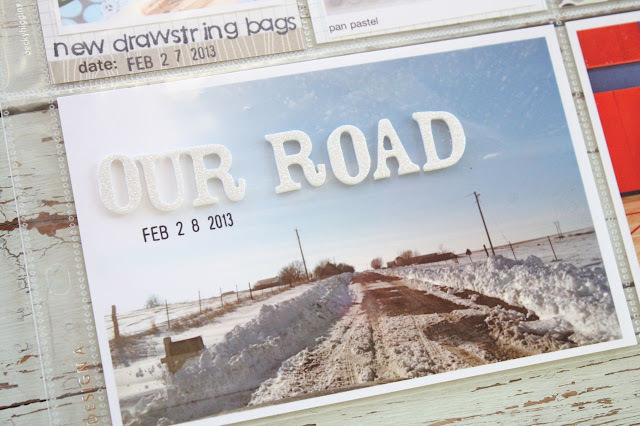 My projects will be up in the Gossamer Blue Design Team Gallery + I'll be sharing them here on my blog with mini tutorials. I've been practicing my watercolor techniques on a few kit items......that floral paper is my favorite from all the May kits. I'll be sharing more mixed media techniques also using my Mixed Media Kit. 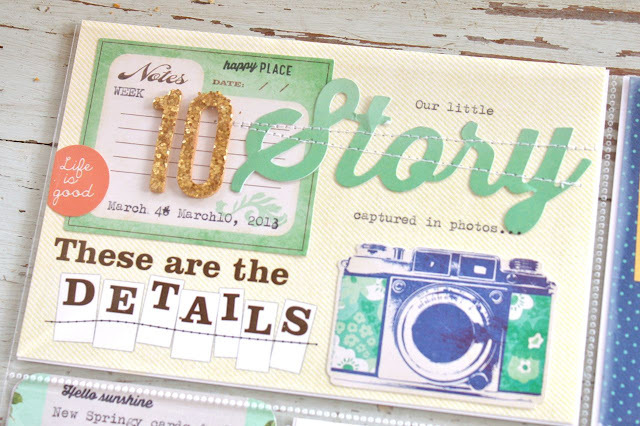 Soooo many fun embellishments, did I say that already? And a whole mix up of products using up the leftovers.....it's gonna be a fun month. 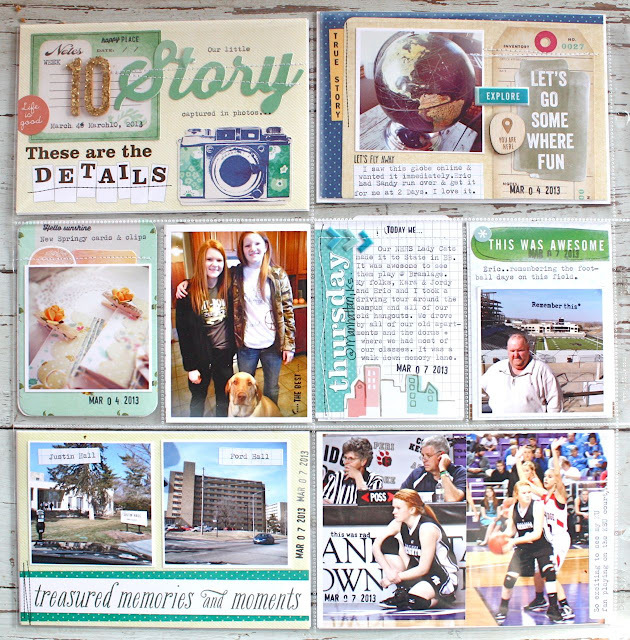 In addition to my monthly Gossamer Blue projects, I'll be sharing my art journal pages and more art-like projects. Here's my first attempt using my new Dylusions Creative Journal. This is just a start to my first pages and I'll be sharing the completed layout soon. 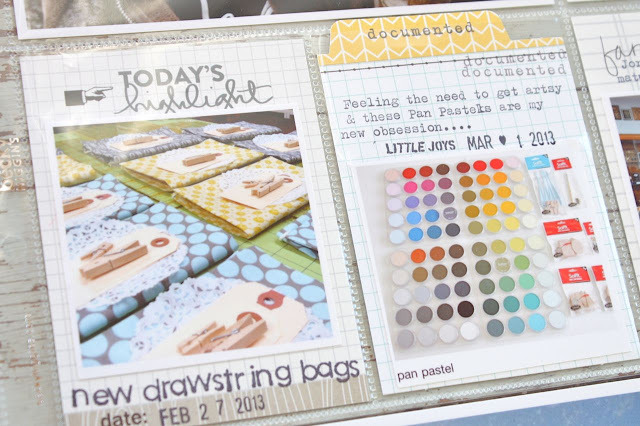 I have to say that this art journal is fantastic if you're interested in getting started in art journaling. The quality of the pages is really nice and sturdy. I'll also be doing my best to keep on track with my Project Life 2013. I'm a few weeks behind right now and I can feel it creeping up on me.....that time of year when I always get behind because the Summer months hit. I'm realllly hoping to keep on top of it this Summer. 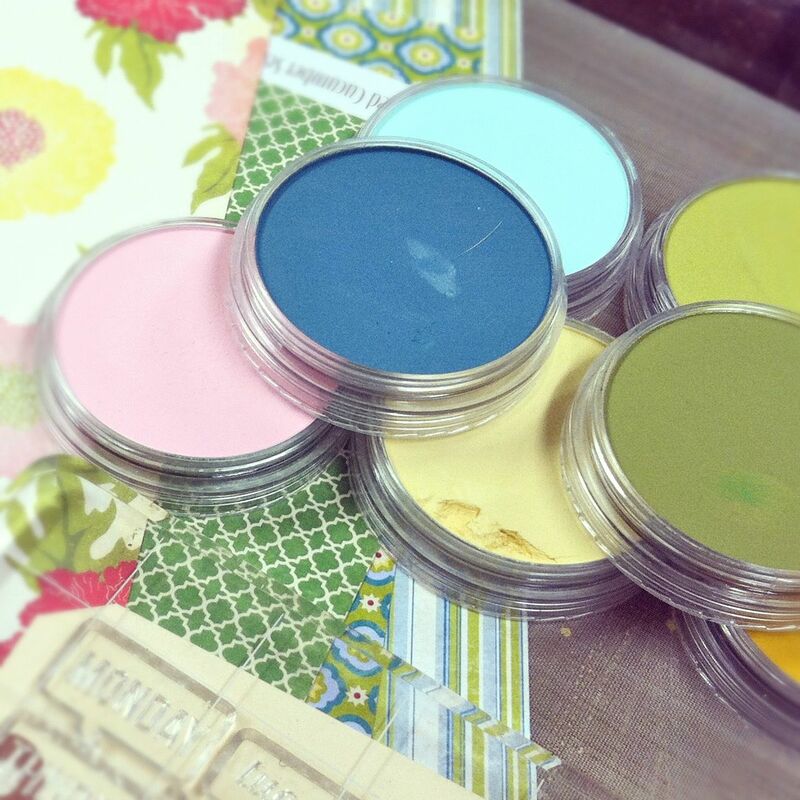 Shop updates.....I've got some new items coming to the shop this Summer. They'll be trickling into the shop every so often. October Afternoon update.....I decided not to renew my contract with October Afternoon so April will be my last month on the Design Team. The products are so great and I look forward to working with them....I'll just be back on the customer side of things now. A big thanks to everyone at October Afternoon for having me and I wish them the best of luck. And in addition to all this, I've started a Summer bucket list that is getting long already. I'm going to have the girls and Eric add to the list and we'll see what happens. I've got about 3 weeks to prepare before school is out and then we're gonna tackle the list. 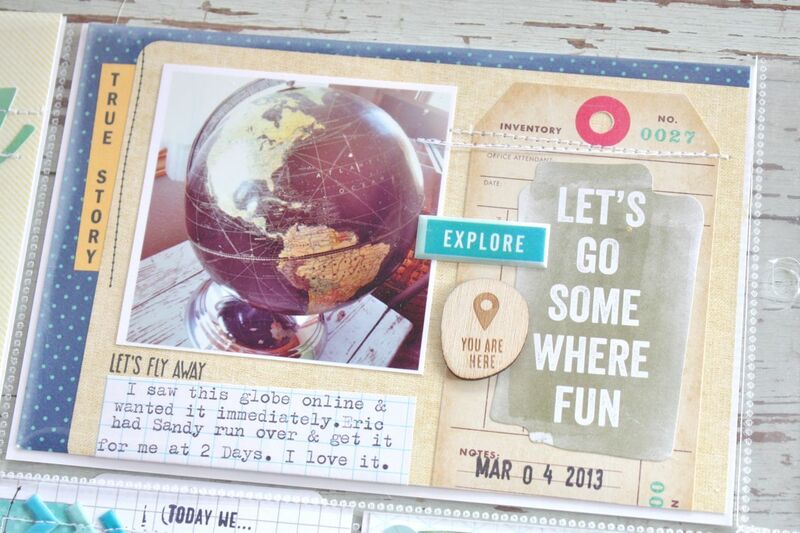 I'll be sharing some of those ideas in my Summer bucket list post soon. So tell me...what's going on in your world? Any new crafty projects you want to tackle? Summer projects? I'd love to hear what's on your list. 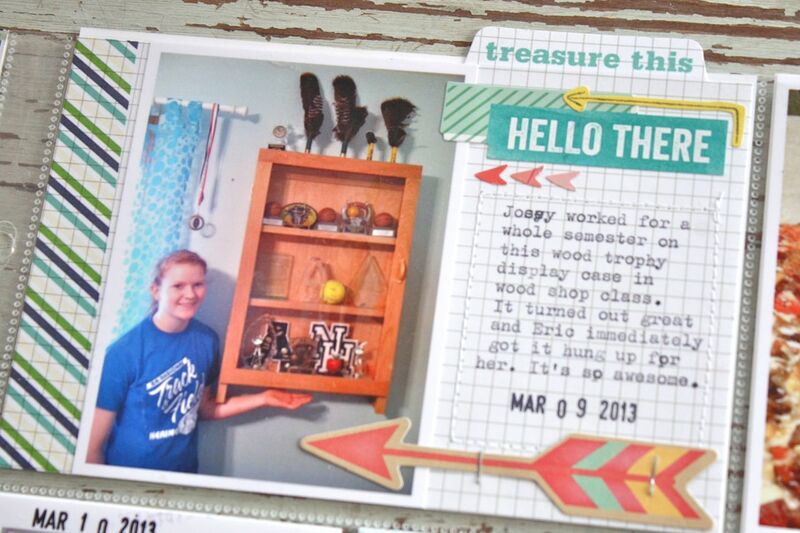 Here's my Week 10 of Project Life 2013. This week has lots of detail but it came together very quickly. 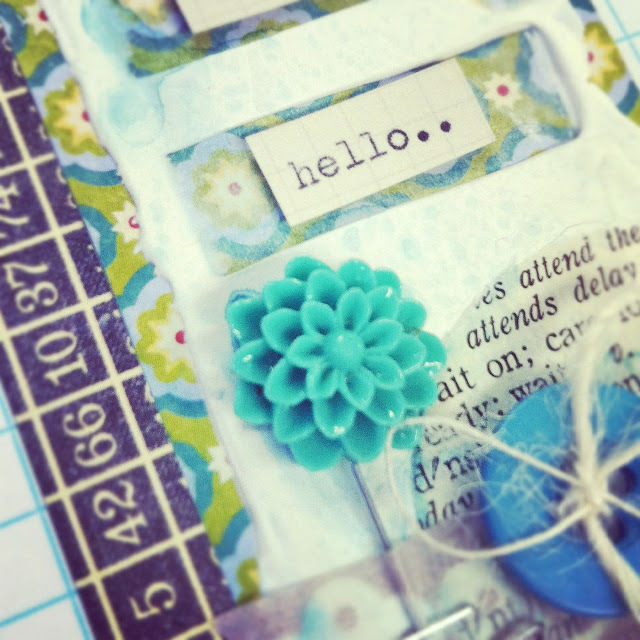 I used 5-6 Elle's Studio 3 x 4 and 4 x 6 journaling cards + lots of embellishments from my April Gossamer Blue crafting kits. 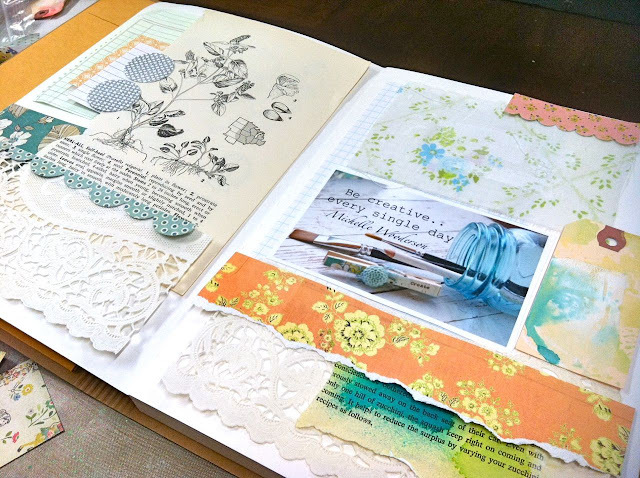 I had so many little tidbits to work with that I didn't reach for any patterned paper. Here's the left side of my weekly spread. Here's the right of my weekly layout. I really loved the Maggie Holmes alphabets and embellishments. Here I topped an Elle's Studio 4 x 6 card with lots of stickers and small embellishments. More Elle' Studio layered with stickers, stitching and stapling. 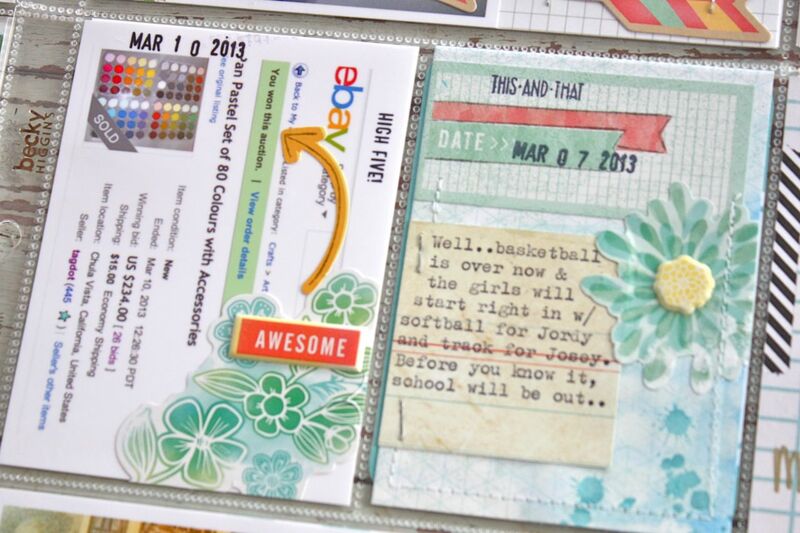 Here I used a journaling card from a Studio Calico kit with a few stickers I added Gesso to. 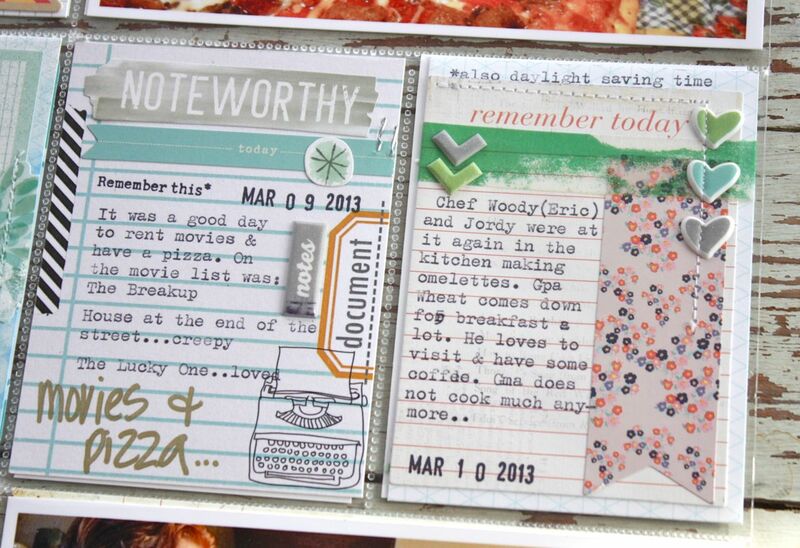 Loved this Evalicious journaling card on the left. 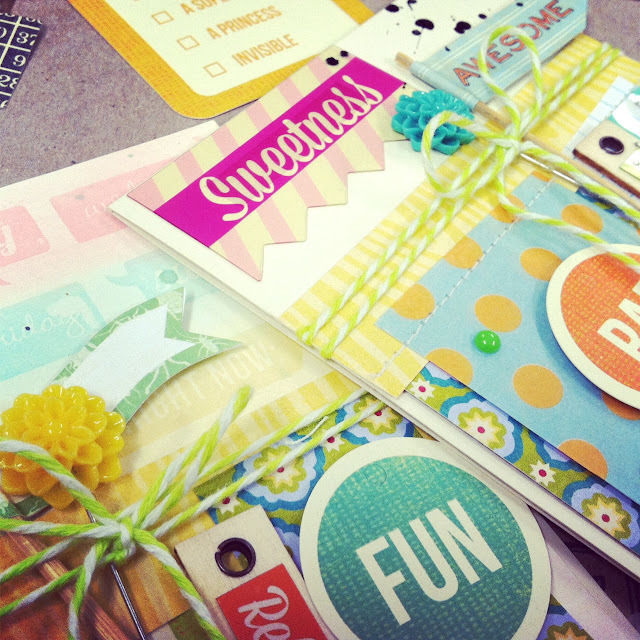 On the right I used fun stickers to a typed journaling card. Here I added stickers to a screen shot of an ebay purchase. On the right I added a sticker and some watercoloring to my 3 x 4 insert. Another week in the books. This was such a fun one to work on. If you've ever thought about subscribing to a kit club like Gossamer Blue, it's so great for Project Life. 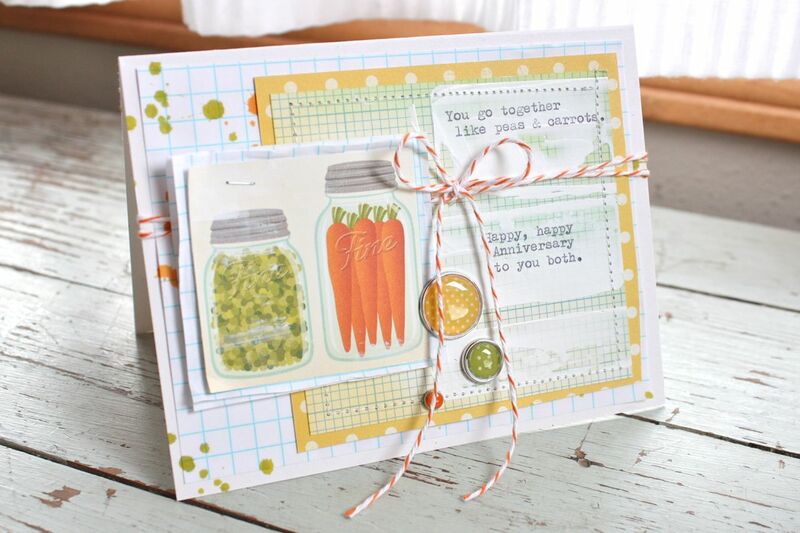 There's a great mix of embellishments and it's fun to challenge yourself to use what's in the kits. Today I'm sharing Week 9 of my Project Life 2013. I've got lots of weeks to share so I'll be adding those new posts soon. 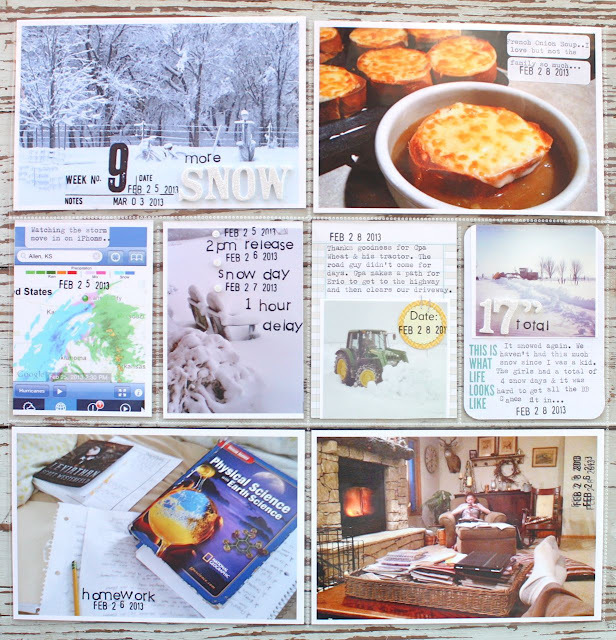 Week 9 was all about getting more snow. Ugh, I'm sick of snow and the cold weather so I'm definitely glad that this week is in the book. 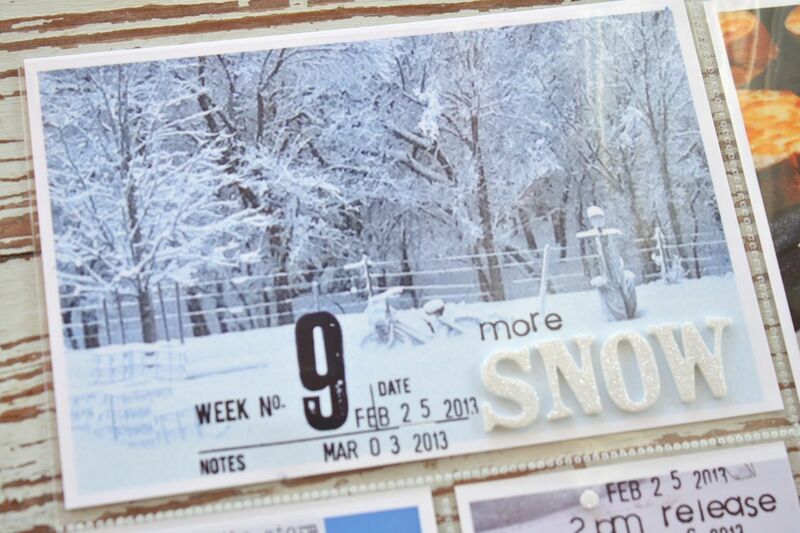 I've been adding a lot of stamping right onto the photos. 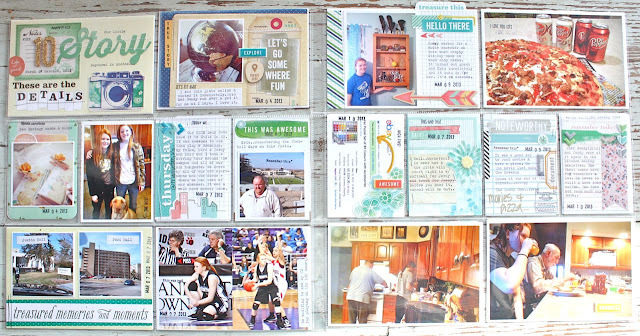 I just find open spaces on the photo to add my titles or short bits of journaling. Here I added some stickers too. More stickers and the date stamp right onto another photo. Sometimes I'll use my vintage typewriter to type out a little journaling too. I love how it leaves the photo looking uncluttered. 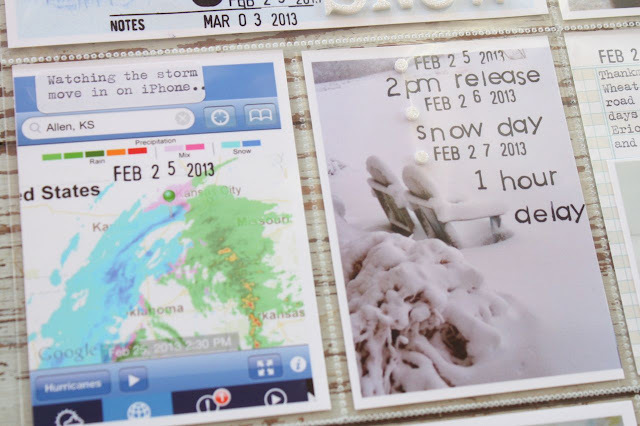 The weather map and some stamping on a photo, noting our snow days and school delays. Gotta take some photos when there's lots of snow. This is the most we've had in ages so I'm glad we snapped a few photos. 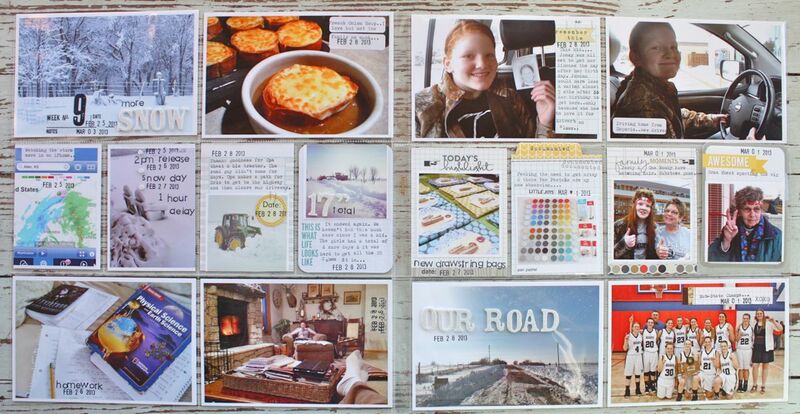 Love the tabbed journaling cards by Elle's Studio, on the right. Short and sweet for today. It's finally nice and sunny outside so I'm busy with recycling, cleaning up the garage and other little chores. 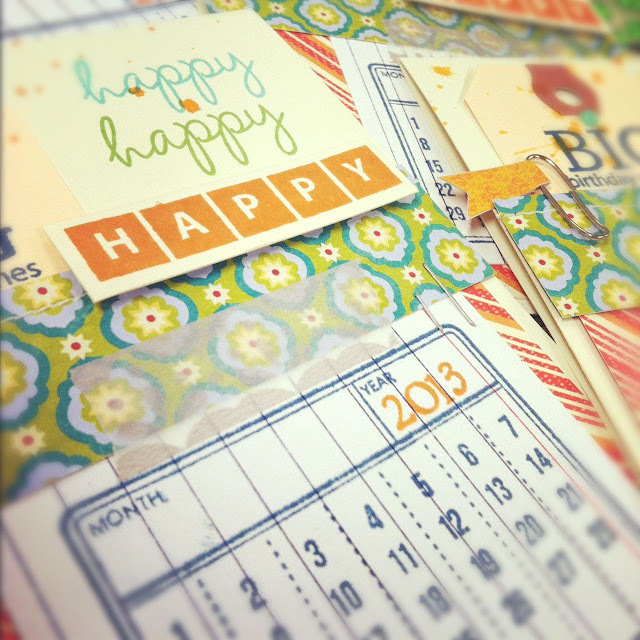 So how are you doing in keeping up with Project Life this year? I'm about 3 weeks behind which isn't too bad. We're having 11 kids who aren't going to Prom this weekend over for a non-Prom movie/Wii night on Saturday. The hubs and I will be busy driving kids to and from their planned events + I always love to make the kids snacks and have the house cleaned up. So I'm taking the rest of the week to work on Project Life and get photos printed. 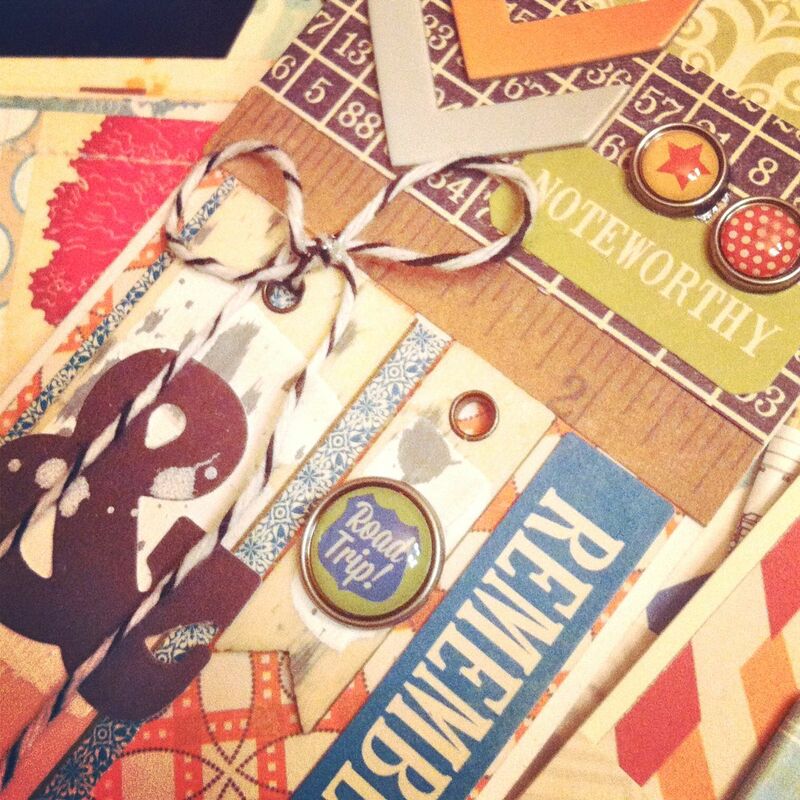 Plus it's a good way for me to make visits to the basement often when I need to print photos or head into my craft room. Good times. I'm back today to share a few more art techniques I tried out on the Mixed Florals Card Kit. For the first technique today I'm using a sheet of the dictionary paper paired with Gesso from the Mixed Media Kit + acrylic paint mixed with water to create a spray mist. 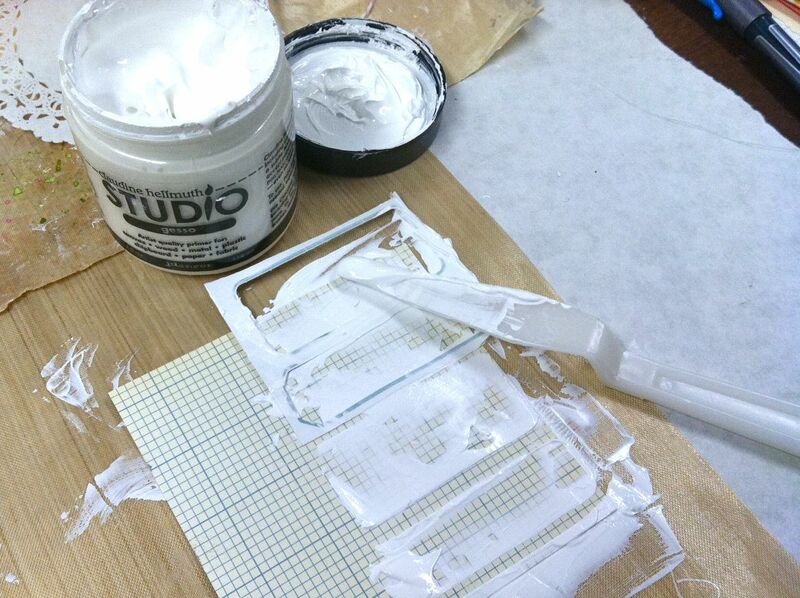 I spread some Gesso onto the book paper with the palette knife included in the Mixed Media Kit. I then misted the page with the spray ink. 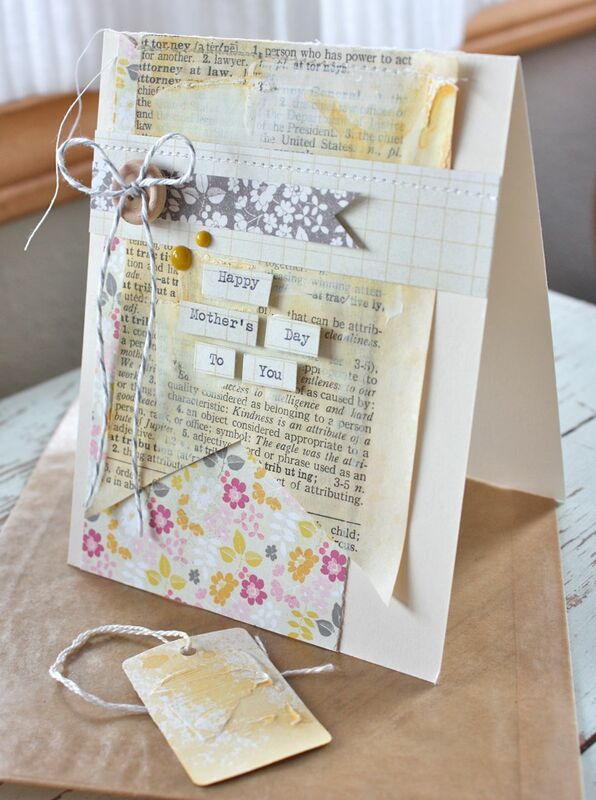 The result was a soft, altered page that made a perfect background for some other layers and embellishments. When you spread on the Gesso to create heavy layers in some spots that leaves a great place for little card sentiments whether you stamp them or type them out and cut them apart like I did below. The next technique I tried spreading modeling past onto tags from the card kit using the palette knife and a Pink Paislee stencil. I then sprayed more paint mist on top, leaving some of the modeling paste white. As you can see my colors from my work room are off from the real tags once they dried but you still get the idea. I love that these look somewhat like old wallpaper with the raised finish. I'll definitely be trying this out again on cards and such. 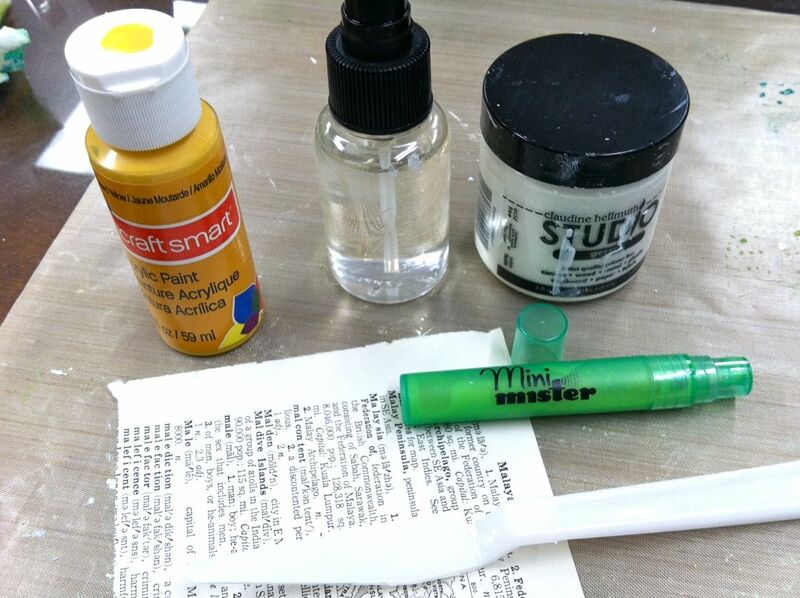 If you want more of a worn look you can sand off some of the ink with a fine grit sand paper or sanding block. 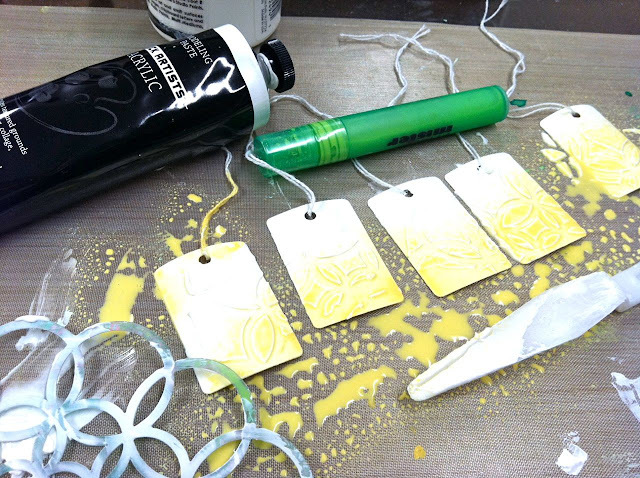 On a few of the tags, I just spread Gesso with no stencil. 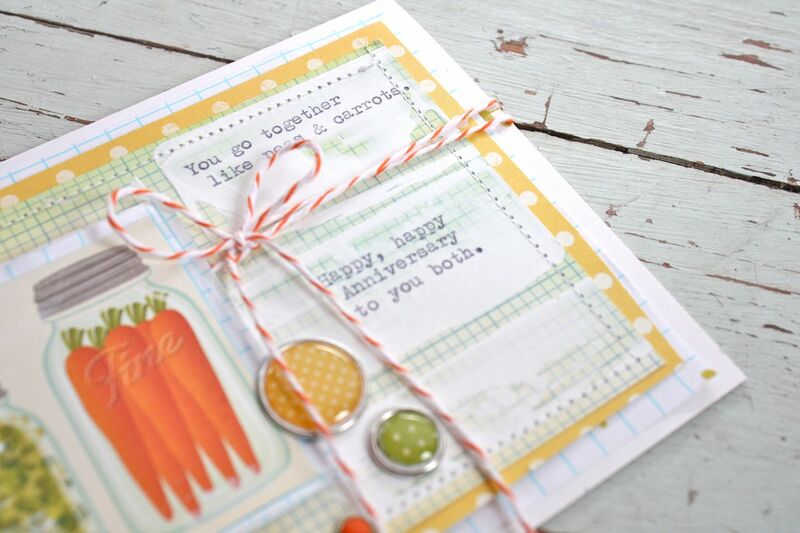 Sometimes when creating a card you'll notice you have some big spaces with not much going on. Or perhaps you made a mistake and smudged some ink, etc. Adding modeling paste with a stencil and a palette knife onto cards is a great way to add some textured interest. It can cover up those little mistakes or just add another point of interest for the eye to land on. 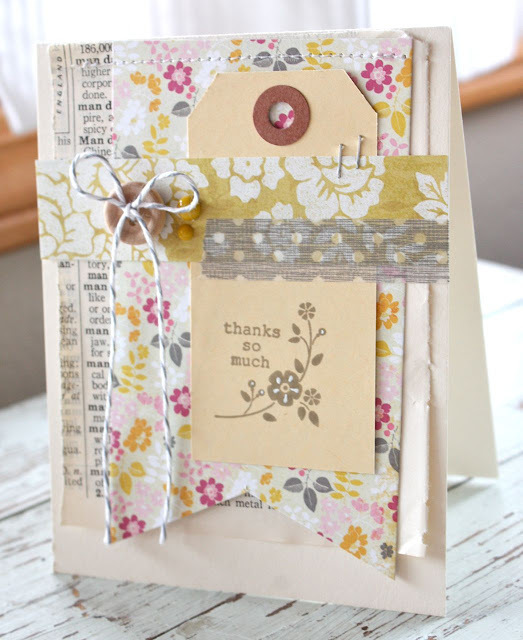 Here I used a Pink Paislee stencil to add a design to an open area on my card. I like to create an organic shaped area instead of using the entire stencil or rigid boundaries. 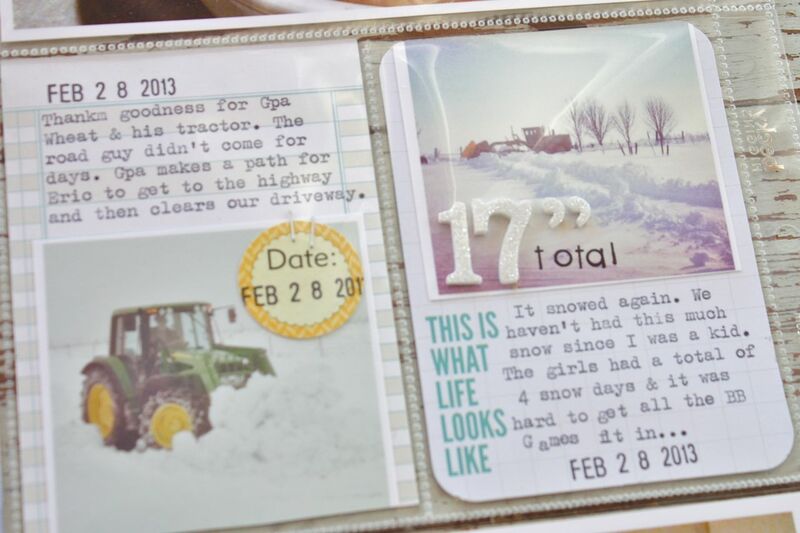 Here's the finished card once the modeling paste dried and I added the other embellishments. I really love the look of the modeling paste here. That's it for today. Thanks for stopping by. :) I'll be sharing some Project Life pages soon + a page from my Dylusions art journal. Hi everyone, hope your week is off to a good start. 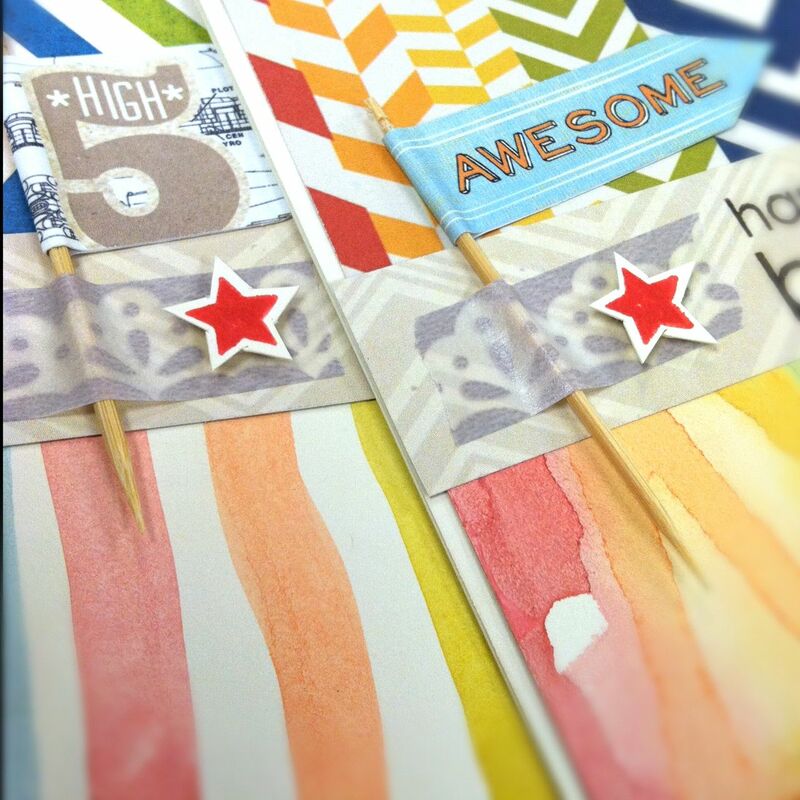 This week I'll be sharing two posts showing you how to use some art techniques on your cards. 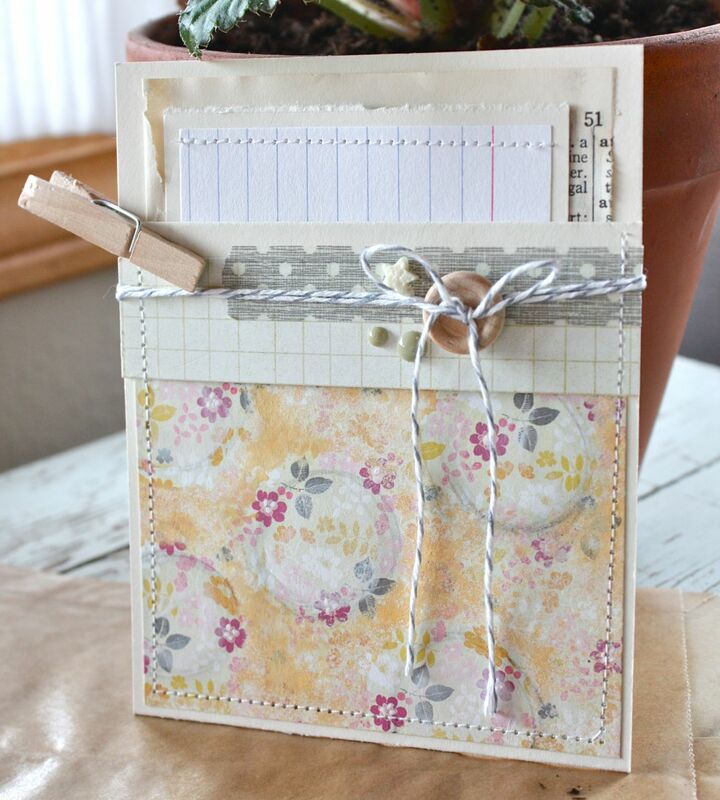 I'll be working with the Mixed Florals Card Kit shown below. I'll also be using the fun products from the Mixed Media Kit. 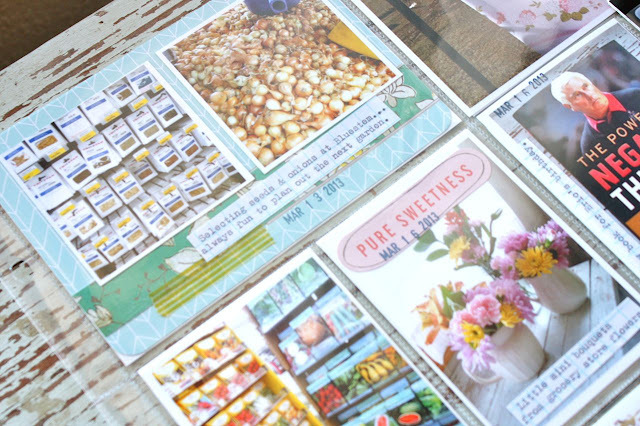 As a special offer, I'm discounting $5 off your order for those who order the Mixed Media Florals Card Kit and the Mixed Media Kit together, while supplies last. First off, I'd like to say that I've definitely been doing a lot of experimenting lately. Trying new things. 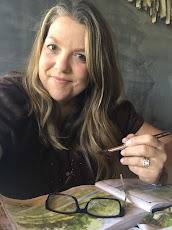 I'm sharing the journey with you and hope that you're inspired to maybe try something new too. I'm not a professional artist by any means, I'm just having fun and sharing my findings along the way. First up is a basic card with no artsy techniques in case you just want to make cards using the card kit only. 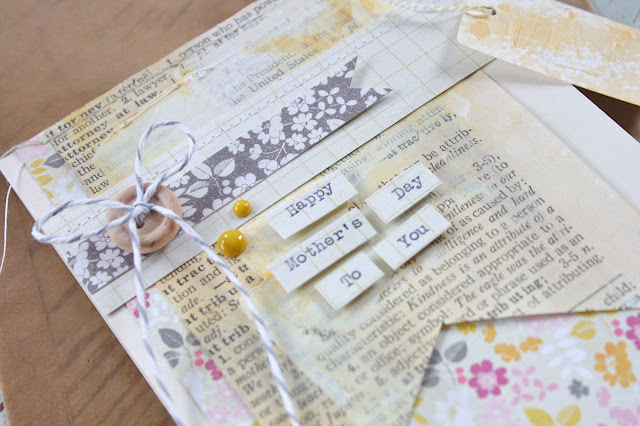 I just used items from the card kit + some twine, staples, a stamp(old SU! 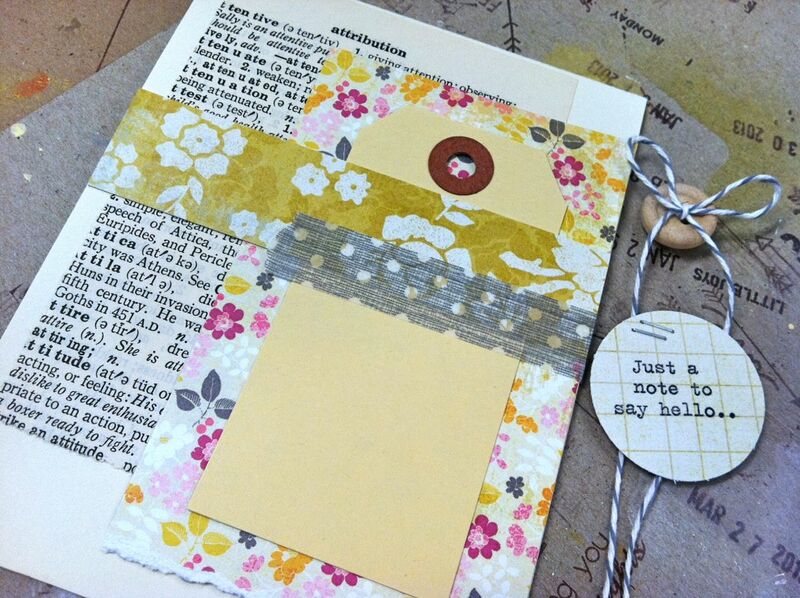 ), washi (Freckled Fawn) and enamel dots (My Mind's Eye). I've been using this card layout on lots of my cards lately. I can layer all the pieces together, stitch at the top and then just adhere to my card front. The patterned papers in the card kit are from My Mind's Eye. Now onto the art techniques. 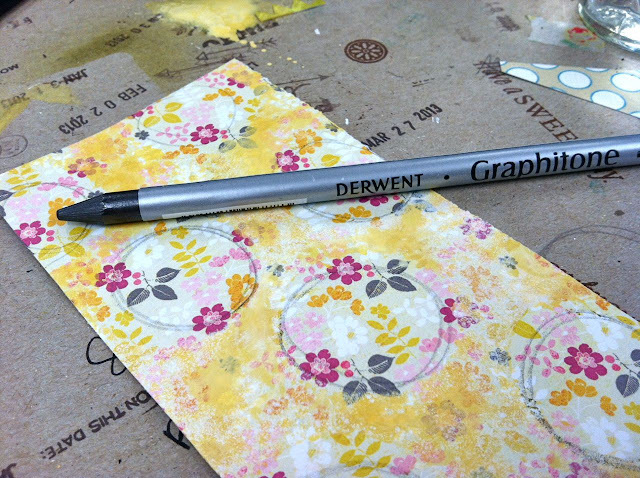 Today I'll using the Derwent Graphitone water soluble pencil (from the Mixed Media Kit) on two separate projects. First up I wanted to show how you can draw simple, straight lines to add some interest to projects. I used a ruler and just two lines across my strip of patterned paper, see top sample. The bottom strip of paper shows the results when I wet a paint brush with water and gently colored over the lines. 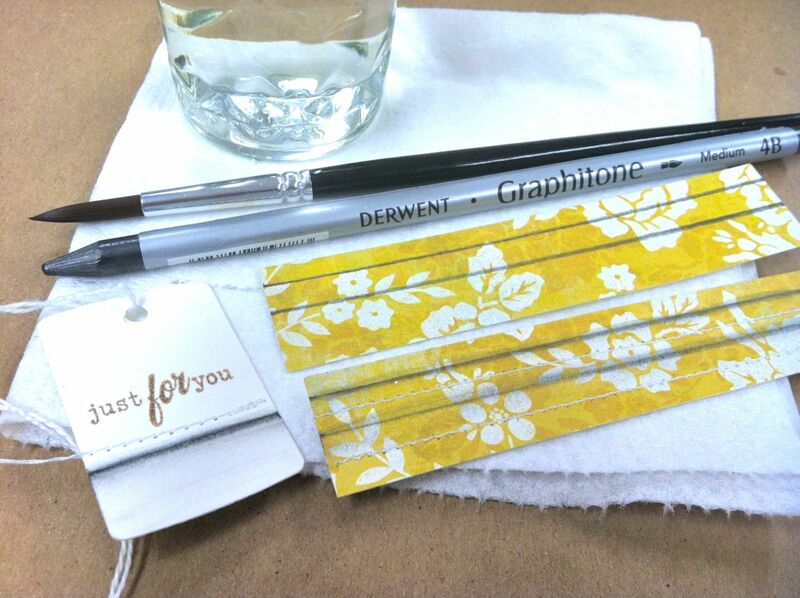 The graphite in the pencil softens out when mixed with water. You can see the same effect on the tag below. I've always been a fan of pencil lines so I just love that I found these blendable pencils. There is no color per say in the pencil, just the graphite look. Here's the finished card I made. 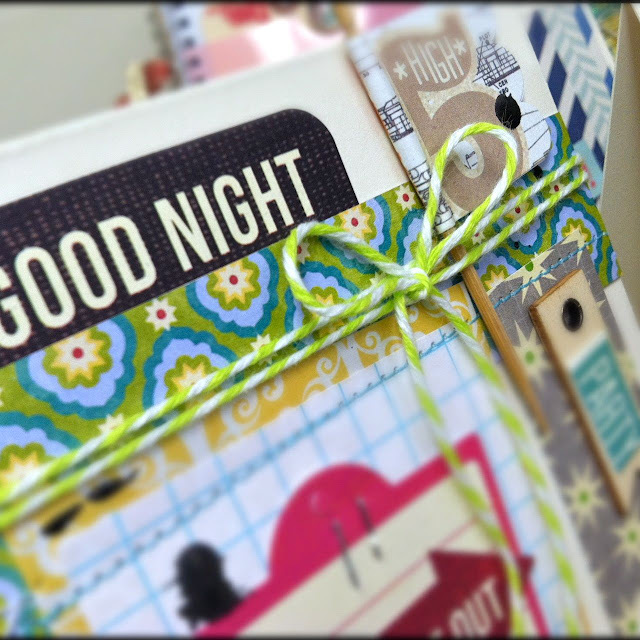 You can see that I used the pencil on the horizontal strip, the dictionary paper, under the sentiment and on the tag. 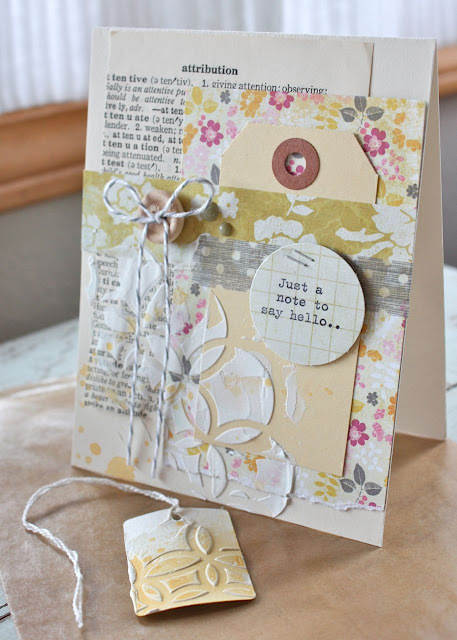 A very soft look on this card using just simple, drawn lines. Next up I'm going to show you how to use some masking, spray mist and scribbled circles using the Derwent pencil. Please excuse these work in progress photos. They were taken in my work room at different times of the day and the lighting gets wonky due to the lack of good, natural lighting. 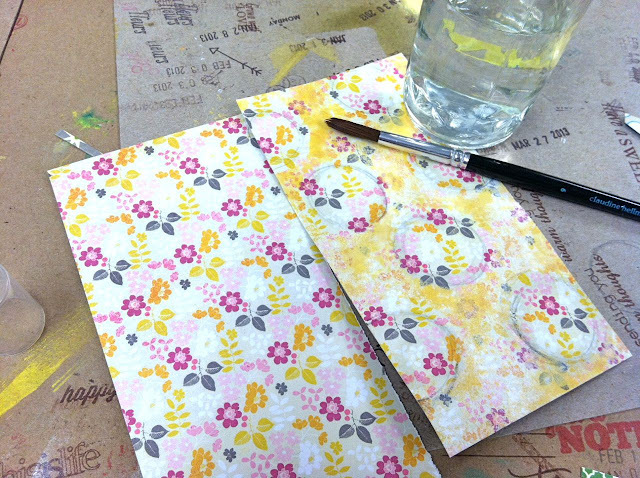 First up, I took a piece of the floral patterned paper from the card kit. 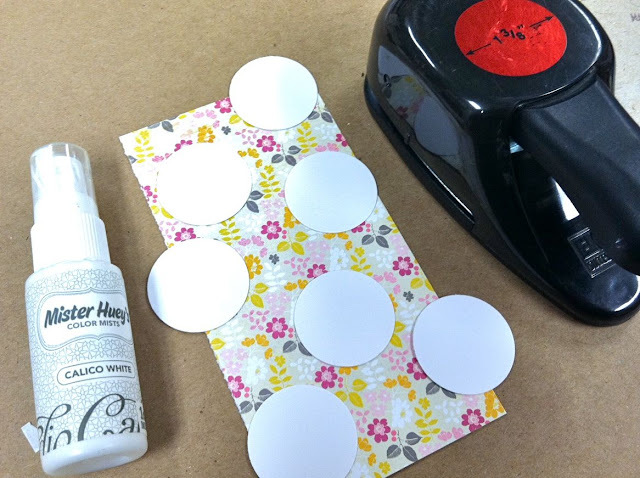 I punched some card stock circles to use as masks over the paper. I started out misting with white spray ink but the effect didn't show up much. I mixed up some craft acrylic paint and water in a mini mister. You get 3 of these in the Mixed Media Kit. I love using the acrylic in the misters because you get more of an opaque look. You can see the misting in the photo below. I used my heat tool to speed up the drying process. For the next step I scribbled some circles using the Derwent pencil. This is a pretty cool look in itself so you could stop right here if you wanted and use this piece on a project. I wanted to show you what the scribbled circles looked like when blended with water so I did this additional step, shown below. It reminds me of vintage wallpaper which is a look I love to see on projects. 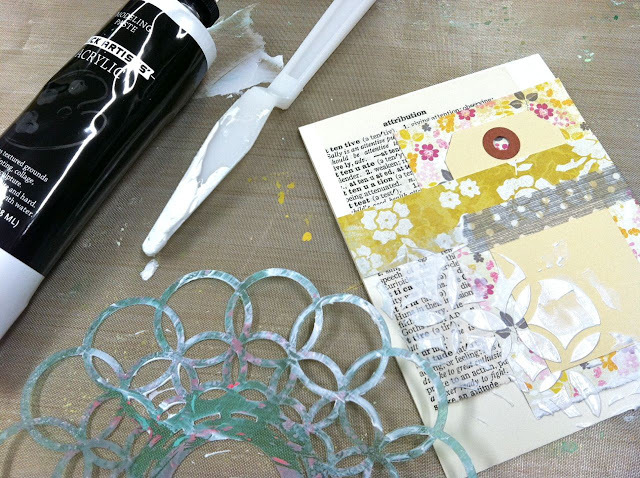 To brighten up the insides of the circles I even took some Gesso from the Mixed Media Kit and applied it to the circles using my fingertip. Here's a comparison of the original piece of patterned paper on the left and the altered piece of patterned paper on the right. 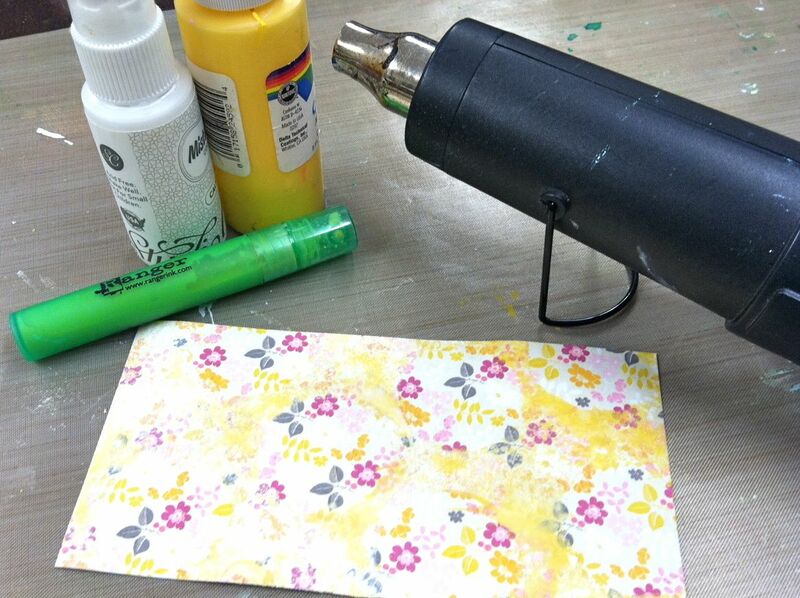 Here's my finished project using the altered piece of patterned paper. The effect is very subtle and soft. 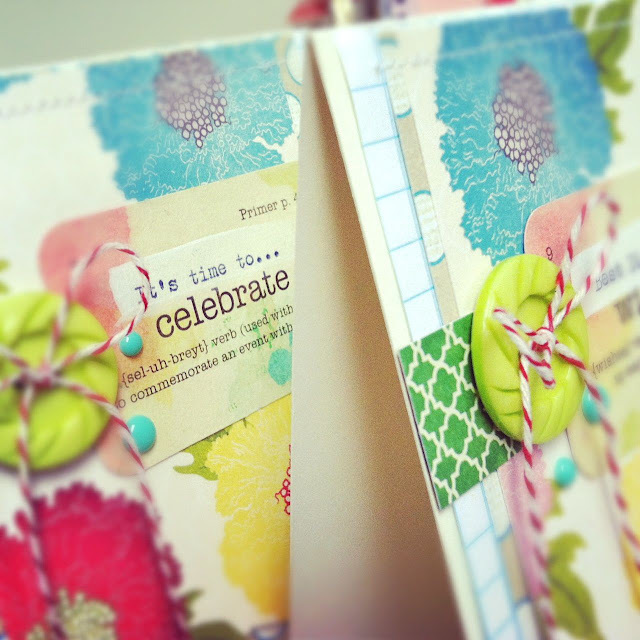 I created a pocket card just using a half sheet of 8.5 x 11 cardstock then stitching up the sides. 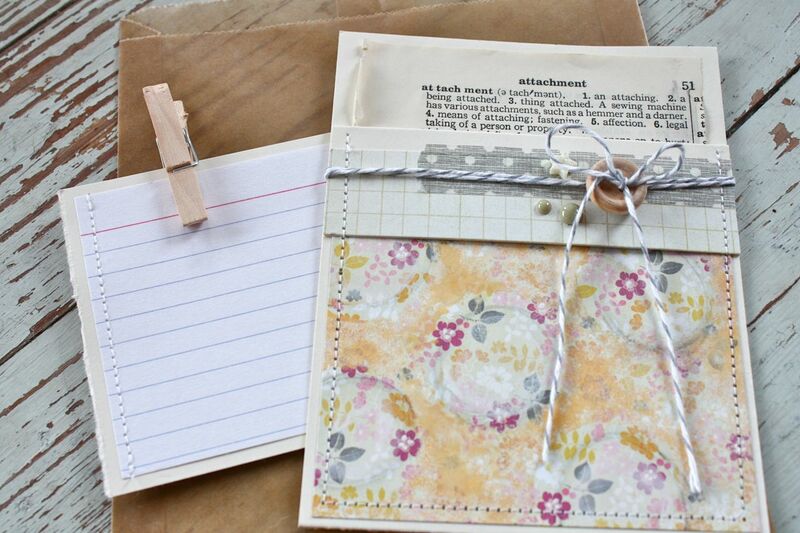 For an insert to write a message or possibly add more stamping, I adhered an index card to a piece of plain cardstock then stitched. 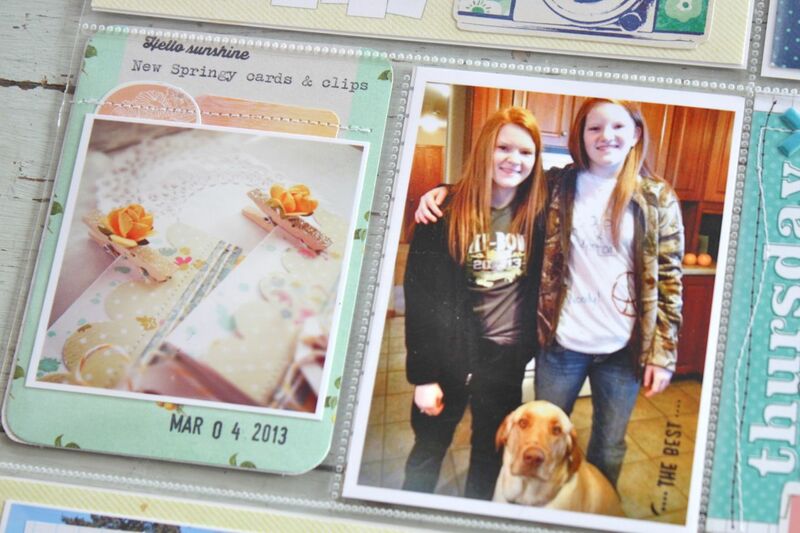 The pocket style card would be great to add a gift card for Mother's Day or graduations, etc. Okay, those are my two techniques for today. I hope you try them out. My next post will show the Mixed Floral Card Kit combined with Gesso and modeling paste from the Mixed Media Kit. Thanks for joining me today! Hi everyone, today I'm sharing a project that I had up on the October Afternoon blog not too long ago. You can see the full post over at the OA site. 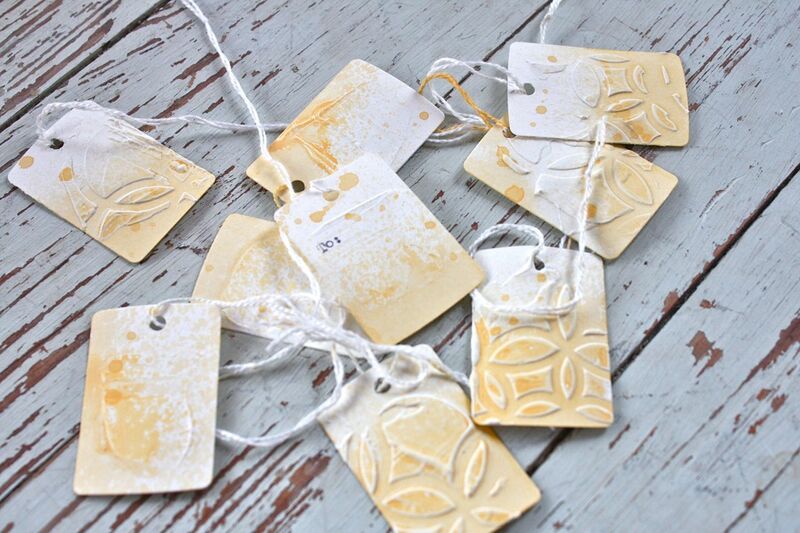 I used label sheets that were nearly all used up to create stencils. 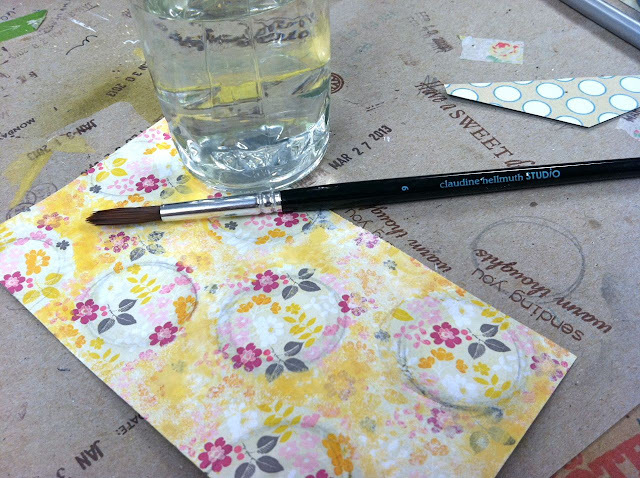 I swiped Gesso over the label spaces to create some fun, textured areas on a piece of patterned paper. 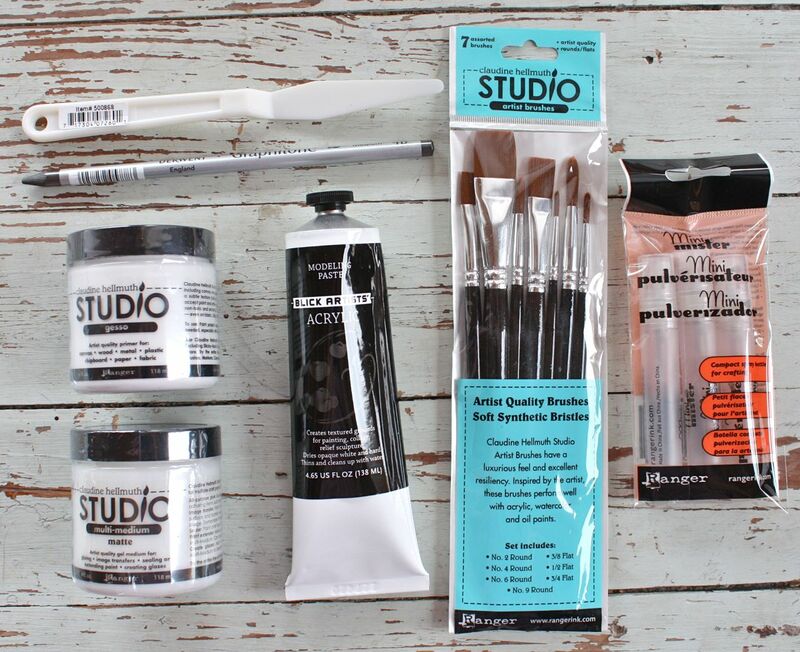 You can find Gesso and the palette knife in this Mixed Media Kit that I now have in the shop. 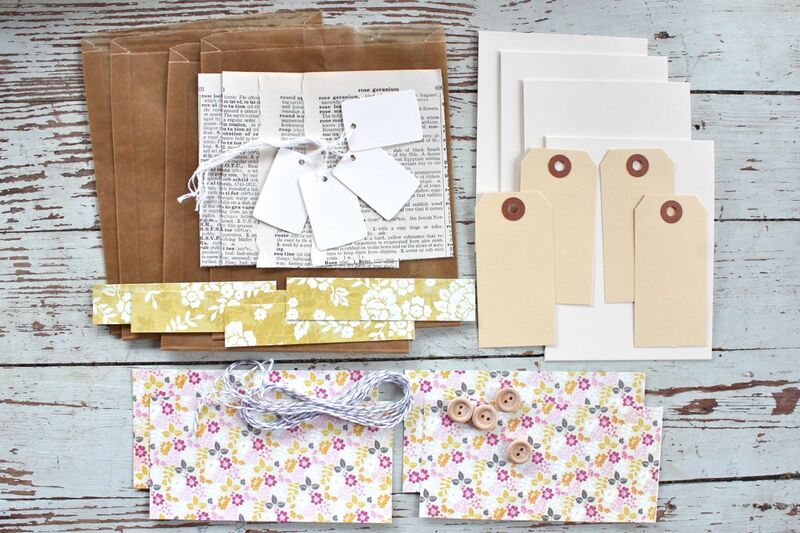 You can get the Mixed Media Kit at a discounted price when purchased with the Mixed Florals Card Kit. 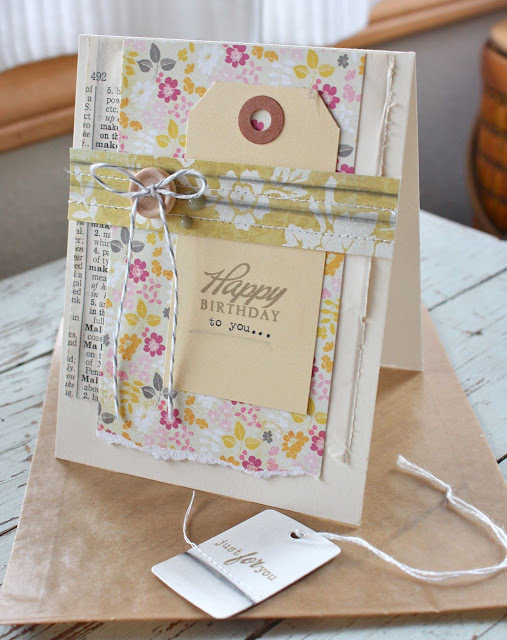 Once my Gesso label piece was dry, I used my vintage typewriter to type out my card sentiments. I used peas and carrots jars from the October Afternoon Farm Girl collection and coordinated my sentiments for a whimsical anniversary card.